When members of your community are looking for local services -- like plumbers, doctors, specialty stores -- the phone book is the #1 choice for Baby Boomers, but the Internet is where our younger generation looks. Once a library identifies its key word descriptors -- for each of its branch libraries -- then it is time to add them to local online directories. 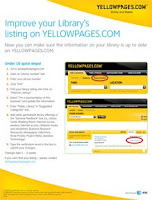 Here is how to add to the YellowPages.COM. Share the "how to" with other public libraries and help build a common set of search terms for public library services. Adding key descriptors for permanent programs is also a good strategy for your local businesses, so this is a good tip to promote in your Business Reference section. How about: wifi, computer classes, audiobooks, downloadable audiobooks, e-books, DVDs, art in public places, tax forms, legal forms, free ... all this stuff is what people at my branch ask for over and over.